Mouth-watering color and silky crepe-paper petals make this poppy a scrumptious showpiece throughout summer. Splashy watermelon blooms are dotted with a delicious creamy white center, ideal for cooling sunny beds with small or large drifts. Easy to grow and fast to flower. Annual poppies are grown from seed sown directly in the garden after heavy frost. Thin to stand about 10 inches apart when 1 inch high. 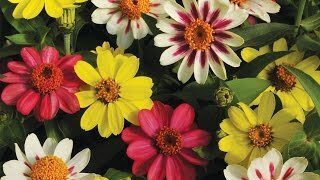 Enjoy the beautiful blooms of these easy annuals in beds and borders. Poppies make wonderful cut flowers. Cut the flower when it is still in bud, and seal the cut end of the stem with a lighted match to prevent rapid water loss. Poppies are also excellent flowers for naturalizing in a wildflower meadow. Poppies are great for rock gardens. Poppies tend to self-sow reliably; leave some spent flowers to develop seeds. Poppy, California Watermelon Heaven is rated 3.2 out of 5 by 5. Rated 1 out of 5 by Dede111 from Waiting I honestly don't know. Bought these for my niece and her hubby who bought a house in New Fairfield, CT which is named Ozland. What could be more appropriate? Will let you know! Rated 4 out of 5 by MontyG from Pretty flowers, need lots of sunlight! I sowed seeds in sunny place (8+ hours) and partial sunny place (approx 6 hr), and the ones in the sunny place did well, although it took approx 2 mos to bloom. It was probably my fault as neighboring flowers were taller thus making shade. The ones in the 6 hr sunlight did sprout but didn't grow as of 2 mos past. So I learned they really need lots of sunlight. Flowers are lovely with a delicate pink color. I imagine next year I will have more poppies in my yard with self-seeding! Rated 5 out of 5 by kimmy from so far so good sown outdoors and they have sprouted...some seeds were duds but many have sprouted regardless...not sure how they will hold up once they get going. Rated 1 out of 5 by yespat from wouldn't start i tried to start these seeds in february indoors to no avail. not one came up. very disappointed. i have grown california poppies in the past with good results.